Gussy was a black-and-white colobus monkey who had lived at the PRC since 1996. 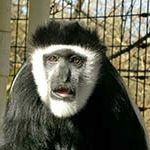 Gussy grew up at the PRC and was living with her fellow female colobus monkeys, Gwen and Alex, before passing in May of 2012. She had developed a severe infection that did not respond to our treatments. The colobus monkeys are generally shy and suspicious, and Gussy was no different. She had a favorite stuffed animal (a Popple) that she would carry around with her. She would always immediately pick it back up when caregivers would return it to her after cleanings. Gussy will always be fondly remembered by the PRC staff, volunteers, and interns.